It's been too long since we've had artisanal vegan sausage by the Field Roast Grain Meat Company! Originally, I was planning on having a good friend over along with his brother who just arrived today for a visit from Europe, where he lives. I was going to make a "man-un-cotti" dish with manicotti shells filled with grilled vegetables and this sausage, but plans changed. I ended up having very little time to cook tonight, so quickly put together this apple-sage sausage dinner for my wife and me instead. 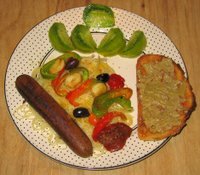 I simply grilled the sausage, sweet peppers sliced thickly, and garlic. I served plain pasta, put a little artisinal extra virgin olive oil on top, and added the sausage, garlic and pepper, and some olives, sundried tomato, and pickled sweet pepper. I also served exceptionally tasty heirloom tomatoes and rosemary sourdough bread, toasted with artichoke tapenade. Quick but yummy! So, here is my list! Nice list. It's definitely hard to narrow it down. I'm with you on the dosa - I do like a good rava dosa too. And we really need to come down for the Thanksgiving feast one of these years. Sounds awesome.